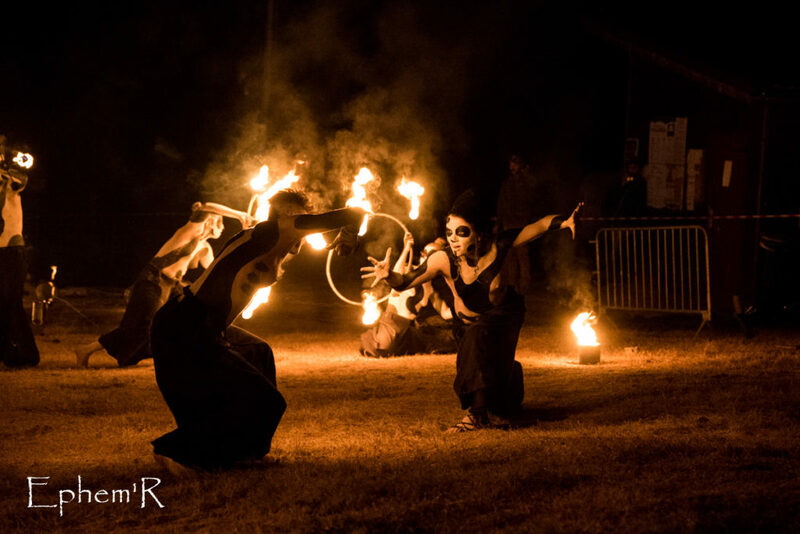 Hadra Trance Festival is a real veteran of the global psytrance culture and the center of French psytrance culture. Going through many transformations to deal with the hardships authorities have been pausing and the natural changes in a very dynamic culture, Hadra Trance Festival always seems to survive and adjust. Dealing with the loss of one of its founders, this special non profit festival is back again in 6-9 of September 2018. 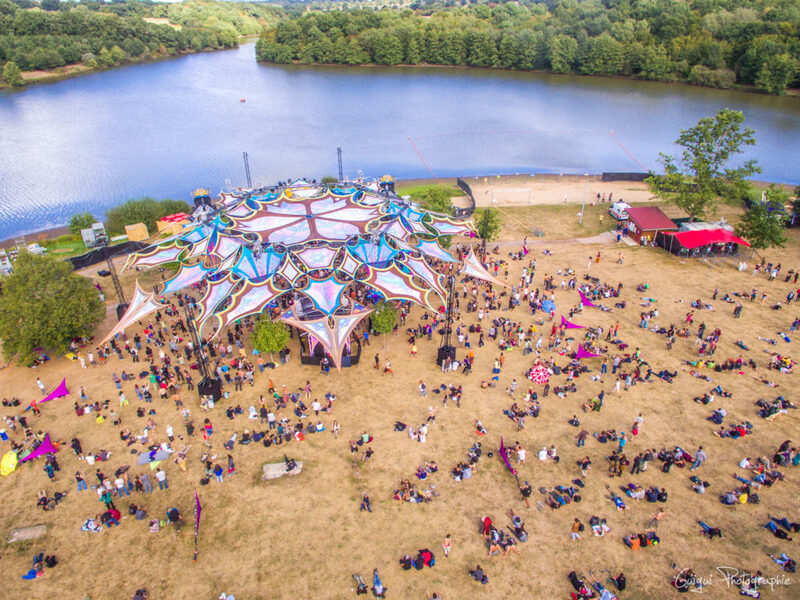 We hooked up with Benoit from the Hadra team to talk about the history of Hadra Trance Festival, DJ Driss and the French psytrance tribe. Q: Hadra Trance festival and Hadra in general are no newcomers, can you share with us a bit the history of Hadra and the festival? Founded in 2001 by a few friends freshly back from the crazy Solar Eclipse Festival in Zambia, Hadra was born from a true wish to bring the amazing energy felt there back to France, where newly promulgated national security laws had started to muzzle the underground electronic music people and scene. Driss, well known as DJ Driss was one of those friends and he’s been carrying the project deep is in heart and throughout its blossoming and more all along his life since then. 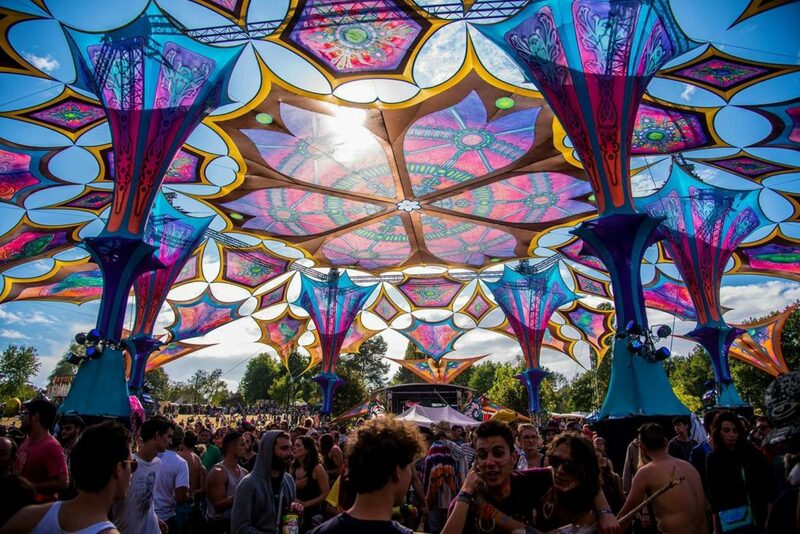 Hadra started as the best way to organize legal parties to gather around psytrance but the success met after a few years was so booming that the project kept developing opening up, from 2004, to new activities. A recording label, Hadra Records, was then founded to welcome French growing artists who had until then no real mean to evolve. A first round of training workshops to electronic music technics came up from 2005 guiding a rising number of psytrance lovers keen to learn or improve their skills of DJ or composer. 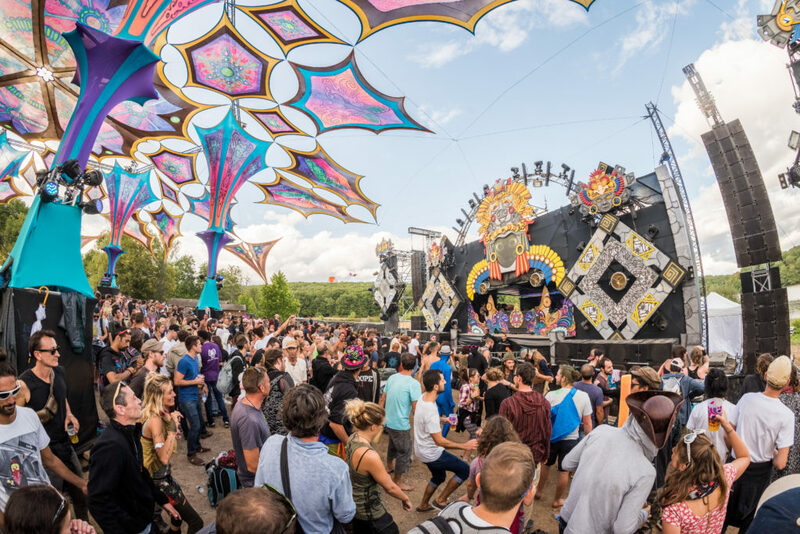 The same year, the first Hadra Trance Festival was created in the french Alps, gathering more than 1,700 people around a 3-day non-stop music festival. The festival had then to change site a couple of times to finally be able to gain a certain stability. 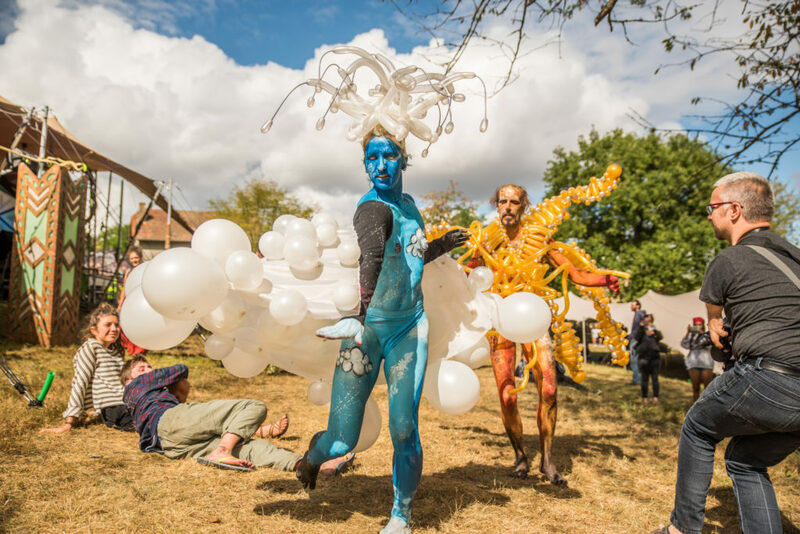 After reaching in 2014 15,000 people within a 4-day festival, the festival was forced to move again, for political reasons, and to settle down after a 2 years search, in a new, smaller and easier site in the center of France, in Vieure. Q: What is the main character of Hadra Trance Festival? The thing that makes it special and differentiates it from other festivals? What special experiences you think people who will come to the festival take back with them? A: Even if the original team has always been around, getting involved in various ways and periods of the life of this amazing project, the fact that Hadra is a non-profit organization lead by volunteering commitment means that the team has always been very colorful and mixed with very different kind of people and energies. 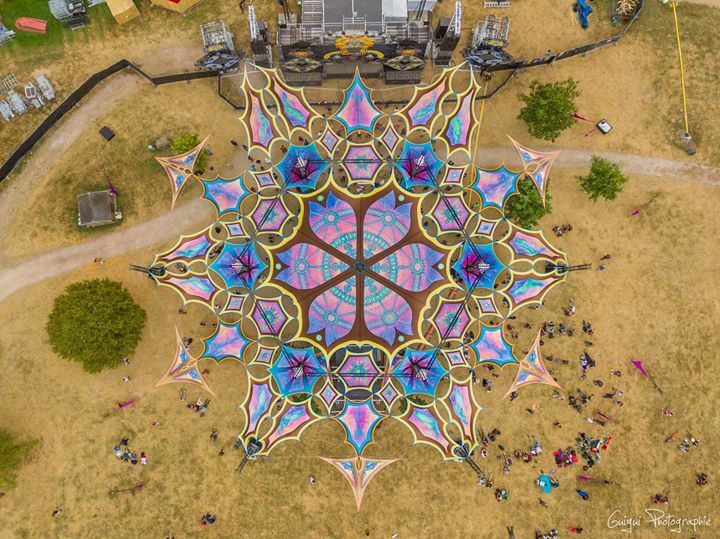 Hadra Trance Festival indeed exists thanks to the involvement of more than 650 volunteers who gather around this project lead by the passion and the love of this unique and blended family. Even if everybody is clearly aware of the necessity of success and breaking even to be able to keep going on year after year and even if some people are paid for their work all along the year, devoted their time to the project, it is not a matter of money profit and increase in wealth. Everybody comes to help to take part in a unique experience and share a galvanizing energy. This is clearly what makes Hadra a very special place where the festival goers can actually feel this particular shared energy that makes them part of the global gathering. Q: Hadra suffered a big loss this year when DJ Driss, one of the founders, passed away. Can you tell our readers a little about him? Was it natural for you to go on with the festival as planned? A: Driss was a humanist, a visionary, an artist, a leader, a lifelover. He was all of this in the same time and we are gonna keep his memory alive. More than 17 years ago, Driss and some friends of his founded Hadra. He was utterly convinced that the key of our common future could be found in human nature, in generosity, in diversity, in the acceptance of each other. Psytrance culture had always been his family, his music, his passion. Founding Hadra was the way of his mission and of his will to offer to psy values and people more respect and a well-deserved seat in a globalised and self-centered society. Driss has become a guide to all those who crossed his path and much beyond the world of trance music. He was a real trailblazer, a raiser of new talents filled with audacity to stimulate every project he believed in until its blossoming. He was devoted, attentive, keen, he exuded happiness onto everyone around him. He had a strong personality but was humble and kind. He always faced adversity with heart and resolution, and fought until the end. 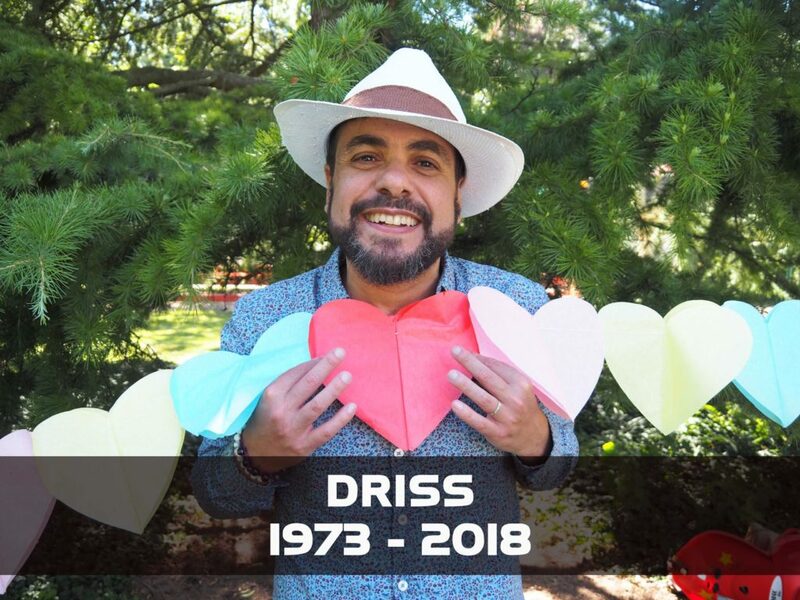 Driss leaves us now with our hearts filled with emptiness and sadness but rich of a wonderful legacy that tells us a lot about living in harmony. This heritage is a great colourful family, not always in synch, but lead by the same passion. His heritage is Hadra and we’ll keep bringing it always further guided by his light. Driss leaves us now with our hearts filled with emptiness and sadness but rich of a wonderful legacy that tells us a lot about living in harmony… His heritage is Hadra and we’ll keep bringing it always further guided by his light. Q: Can you tell us a bit about the festival location? A: The festival takes place in the very center of France in a small town of 200 people called Vieure. The site is a stunning natural setting looking out onto a nice lake and surrounded by tree-filled spaces welcoming 3 stages, workshops and healing areas, a pedagogic farm, vast campsites and caravan parking. By the way, this region is well served by the mayor transportation link, a few hours from the airports of Paris, Lyon and Geneve. Q: How is the Psytrance tribe in France doing these days? 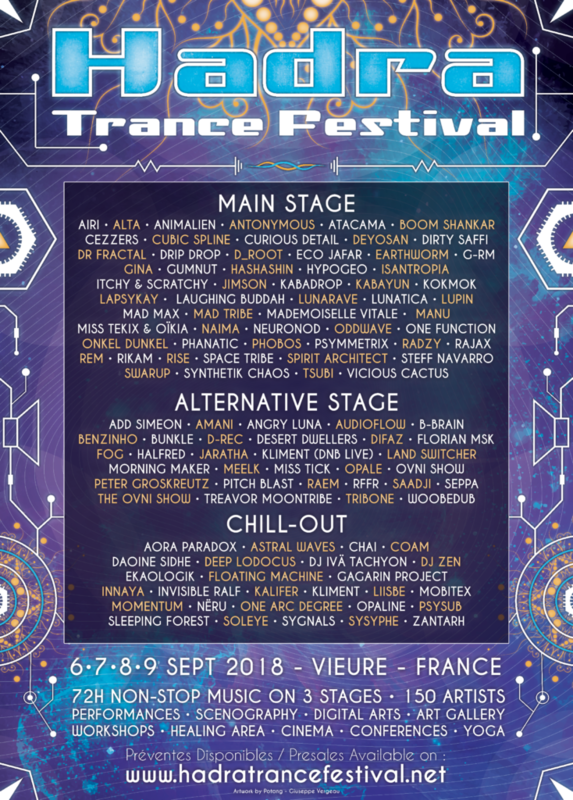 For years, there were a very few teams involved in promoting psytrance, its values and its artists all around France. The audience was also underground and the scene not so highlighted in electro music events and festivals. 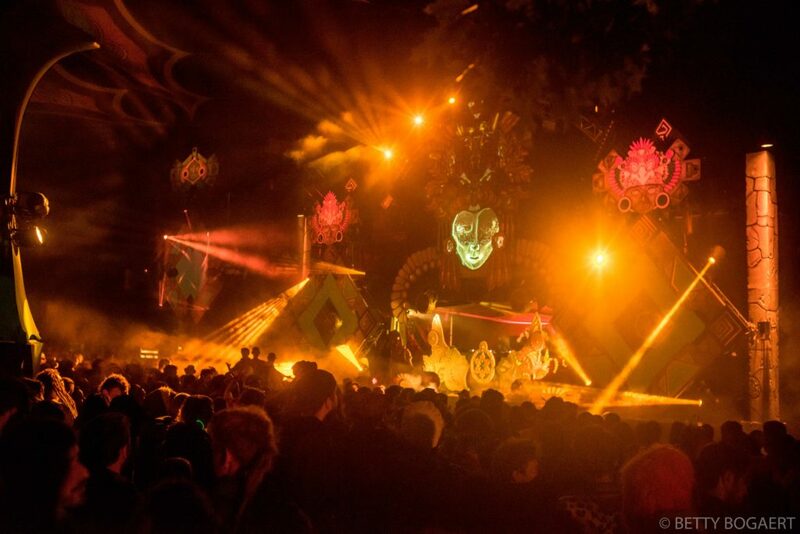 With the fulfilment of the label and the Hadra Trance Festival, welcoming up to 15,000 people in 2014, and amongst the development of other inspiring projets from the main women and men of the scene, Psytrance started to be considered as a musical style worthy of interest… and potentially financially profitable. New psytrance organizers became legion and not always considering the importance of what makes the movement so important: the consideration given to the audience welcoming, to the decor and scenography, to the quality of sound, to the emerging musical scene and much more…so concurrently to the rising of new teams of psy-lovers, galvanized with the global expansion of psytrance music and culture, many other organizers appeared, competing with the biggest headliners and events, focusing on the most mainstream artists, making the fees of some artists increase till never reached levels and so avoiding the smallest teams to promote psy music as a whole. In the past the main psytrance events would have gathered 1,500 people once a year in the country. After a few years of exponential growth 5,000 people events or more were widespread. I’d say that now things seem to turn back to a more regulated movement after a global fashion wave finished hitting the country. But France will anyway keep being one of the main hotspots for psy-lovers in Europe as french people are loads to gather together, all along the summer, attending the profusion of psy-festival all around Europe ! Q: Funniest incident you had in the previous editions? A: Hard to say, I can remember many ! But I’d say that one : the mayor of the town where the festival takes place, pretending to mix on stage during the great finale and turning twice the sound off ! Q: Should people coming to the festival spend some time touring in the area around the festival? Any recommendations? A: That’s for sure, this part of France is amazing and not so crowded in summer time. And there’s for sure a huge amount of things to do, from hikes in wonderful settings such as the great chain of volcanoes of Auvergne, part of the one of the biggest natural park in France and Europe, to some more historical activities exploring a rich choice of medieval and Renaissance castles and fortresses. Without forgetting the largest exhibition out door hall for street art artists in Europe, newly opened in April 2017 less than 50 kms from the festival site !